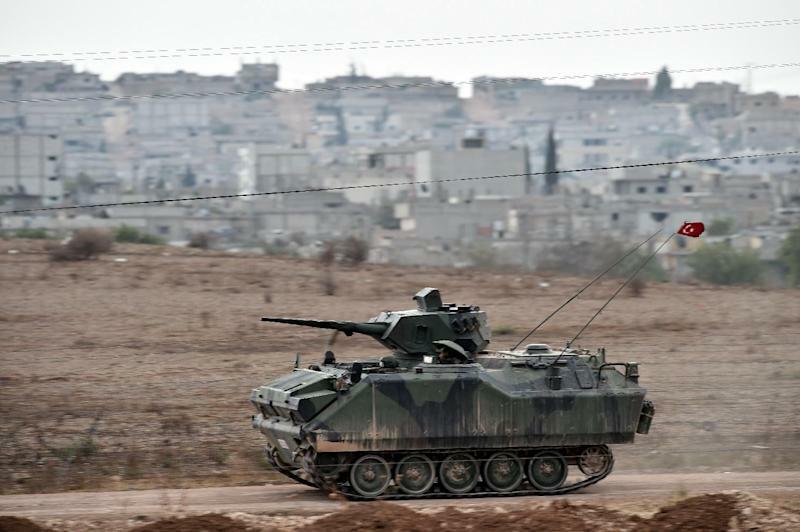 Mursitpinar (Turkey) (AFP) - Attacking Islamic State jihadists met firm Kurdish resistance Sunday in the Syrian battleground town of Kobane, but in Iraq they put government forces under strong pressure. A roadside bomb killed the police chief in Anbar province, between Baghdad and the Syrian border, and Pentagon officials have voiced concern about the government's vulnerability to a renewed jihadist offensive. Farther north, around Iraq's key oil refinery town of Baiji, the army and Sunni Arab tribal allies came under fresh IS attack, prompting a first resupply operation by coalition aircraft. 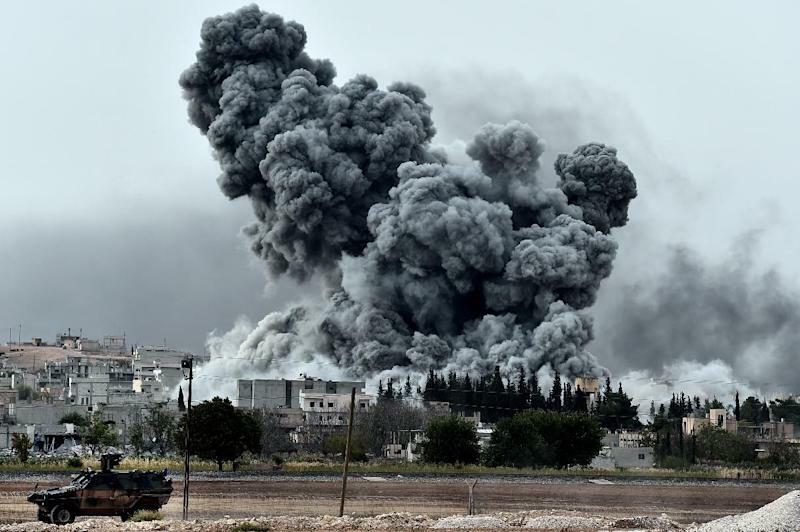 In Kobane, a pall of black smoke hung over the strategic town as the Syrian Observatory for Human Rights reported heavy jihadist losses. IS poured in reinforcements and later fired at least 11 rocket-propelled grenades into the town centre, said the Britain-based monitoring group. The Kurds managed to advance 50 metres (yards) towards their headquarters, two days after the jihadists captured it, but failed to deliver a knockout blow. "They (IS) are sending fighters without much combat experience," Observatory director Rami Abdel Rahman said. "They are attacking on multiple fronts but they keep being repulsed, then countering and being pushed back again." IS has earned worldwide infamy for committing atrocities -- often videotaped and posted on the Internet -- since it seized swathes of Iraq and Syria in lightning offensives earlier this year. But it has also gained prestige among Islamist extremists that has helped it recruit thousands of foreign fighters, a reputation now on the line. "It's a decisive battle for them," said Abdel Rahman. "If they don't pull it off, it will damage their image among jihadists around the world." 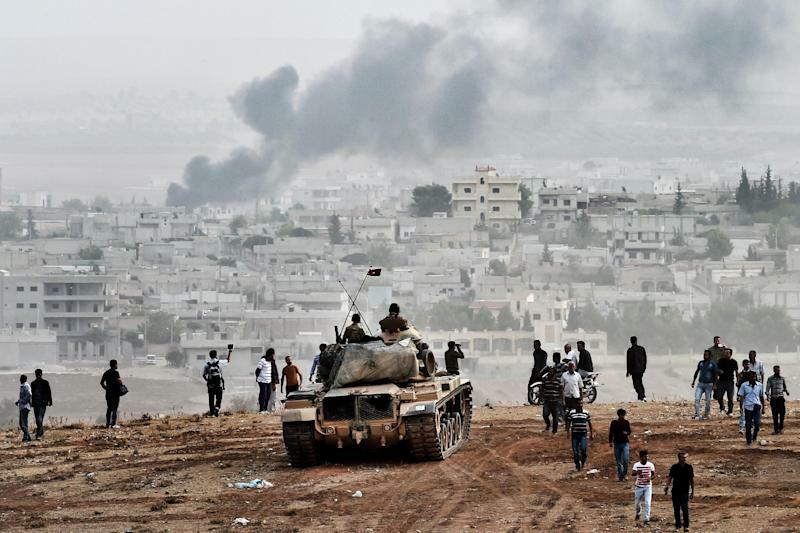 In Cairo, UN chief Ban Ki-moon urged action to prevent a "massacre" in Kobane. The UN has warned that hundreds of mainly elderly civilians in the centre and thousands more on the outskirts all risk massacre if the jihadists sever the sole escape route to the border. The US military said it and its Saudi and Emirati allies conducted four air strikes in Syria Sunday, all but one in Kobane. Despite such raids, Pentagon officials have said there is a limit to what they can do without ground forces they can work with. But the top US officer said American military advisers were likely to take a more direct role once Iraqi forces are ready to fight to retake the country's second city Mosul, which IS overran in June. "My instinct at this point is that will require a different kind of advising and assisting because of the complexity of that fight," General Martin Dempsey said on ABC's "This Week". Despite deep concern about the plight of Kobane in Syria, Washington has vowed to stick to its overall strategy of prioritising the Iraq campaign. Speaking in Cairo at a Gaza donors' reconstruction conference, US Secretary of State John Kerry called the IS offensive on Kobane a "tragedy", but it "does not define the strategy of the coalition with respect to Daesh", the Arabic acronym for IS. Kerry also said the Iraqis themselves will have to win back their country. "Over time we believe that the strategy will build, the capacity will build, Daesh will become more isolated," he said. Anbar province's police chief Major General Ahmed Saddag was killed by a roadside bomb on Sunday. He had been en route to a battleground town near provincial capital Ramadi, one of few remaining government-held areas of Anbar. Washington's strategy has seen it and its partners launch hundreds of air strikes in Iraq in support of Kurdish forces in the north and embattled federal government troops farther south. Coalition aircraft launched five strikes against IS in Iraq on Saturday and Sunday, the US military said. Pro-government forces have come under particularly heavy pressure around the key oil refinery at Baiji, south of Mosul. With the surrounding territory in IS hands, the coalition airdropped ammunition, food and water to its besieged defenders on Friday and Saturday in the first such resupply operation to Iraqi forces, the Pentagon said. US defence officials have expressed mounting concern about the tenuous position of government troops, particularly in the Sunni Arab heartland north and west of Baghdad. With federal troops on the back foot, Washington and its allies have relied heavily on Iraqi Kurdish forces in the fightback, but they too have come under pressure. Three suicide car bombings in a Kurdish-controlled town north of Baghdad killed at least 40 people Sunday, mostly Kurdish forces veterans volunteering to re-enlist. IS said on Twitter the bombers were German, Saudi and Turkish.